Vaporizer is a new and advanced technology that is used for inhaling dried herbs, in the form of smoke and tiny little vapors. 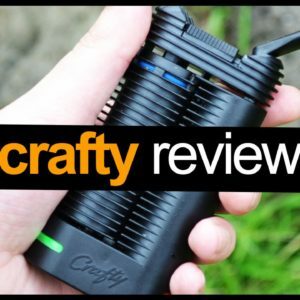 The product that we are reviewing is named as Crafty vaporizer. The article is extremely portable and easy to use; also it enhances your personality as an additional point. Since, the outer look and exterior of this vaporizer have been made in a sleek and stylish form, which is why it gives the consumer a very different and stylish appearance, when the user will be using this vaporizer. The product is highly advanced and tech-enabled. Some of the additional qualities that this vaporizer possess are provision of various other equipment that comes along with purchase of this tem have made this article more appealing and fascinating for the customers. Thee equipment you will be getting along with this vaporizer include a power adapter, USB cable, there will be an extra set of spare seal rings and three extra screens, a drip pad, a filling aid, an herb mill and cleaning brushes will be provided to the customers as well, in order to facilitate the customers, to keep their product always clean. That is the reason that all of those tools are provided to the customers along with this advanced technology, to make their life easier and also make its use comfortable. The most important thing that will be provided along with this Crafty vaporizer, is the manual which is present inside the box, this manual is inserted in the form of a booklet inside it, and it is provided so that if the customer needs to clear out any of his queries regarding the use of this device, or placement of all the parts perfectly, then he must go through this manual, and he will get all of the solutions regarding use of this device. The overall appearance and exterior body of this vaporizer, is like a walkie-talkie. The most important and useful feature of this device is that, designing of the device has been made in such a way that open ridges are present on its exterior, which helps to enable the vapors out of the device immediately, in this way, it helps to maintain the temperature of the device and the temperature drops down rapidly as soon as it starts to get hotter inside. Because of this feature, it helps to preserve the cooling mechanism and also keeps the battery life a bit longer of the device. Size of the device has been made according to the palm size of your hand, so that it may easily fit into your palm and must be easy to use. Like all of the latest and advanced vaporizers are provided with an additional feature of associated applications with it, so is the Crafty vaporizer. This application enables the person to make the required changes in its settings, mode and customize it accordingly. With the help of this application, you may easily set your required temperature even the user may go off the range of temperature, with the help of this app. The application can be easily download in your smartphones via Google Play store and the Apple iTunes store. The reason of providing an associated application with it, is, the device itself is not featured with a LED screen, therefore you may adjust and customize the settings by installing this application. The user may also have additional advantages through this application, as the user may select the settings of that extra boost of temperature, which is enough to give a kick while using it. Also, there are options for choosing, whether you want to keep the power light on or off, or make it slightly dim. There also certain options present for keeping the timer according to your requirement, for shutting off the device automatically. Apart from these features, you may also have a look on different tools that are associated with this device, their purchase rates and other features are also mentioned in the app. The device is supported with a lithium battery in this unit, the battery life has been observed to be lasts upto 3 to 4 sessions. The battery is compatible with pass-through charging, which means the battery itself gets charged simultaneously with the help of its power bank. This helps the users to use this device even when the device is on charging mode. The battery gets charged first, and the power bank switches to the charging of device. The battery life of this device is also saved by the device itself, as it automatically shuts itself down when it has not been used for approximately 1 minute. In terms of the working of battery, it must also be kept in mind that the device takes up to 20% of the battery to heat up the chamber initially and then the device will be in proper running position afterwards, therefore, users can not use the battery feature immediately, once the device is on. The heating temperature range provided by the manufacturer of this device varies greatly, as it provides the minimum range of temperature of up to 104F, and the maximum temperature up to 410F. This varying temperature range allows the user to set temperature accordingly. The main reason for this feature is that, on different temperatures, the user will experience a different taste and effects of vaping dried herbs out of the device. The product is compatible with usage of dried herbs, oils, waxes and concentrates.